In recent years the interest on test automation has increased significantly. Some of the reasons behind this growth include a greater need for faster software delivery processes, increased productivity and cost/effort reduction associated to the tests itself. 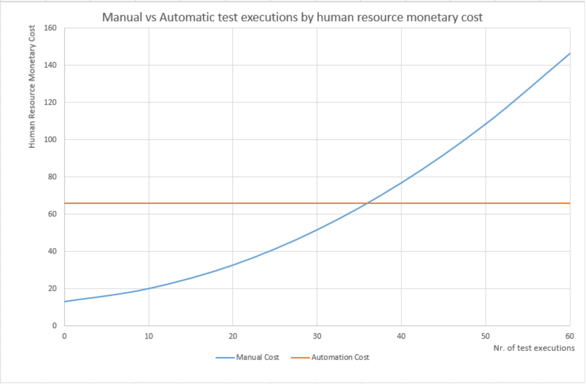 This article will focus on test automation, its advantages and drawbacks and when and how the transition from manual to automatic should be made. The article will also provide some examples of test automation tools, programming languages used for test automation and continuous integration software. How vital is test automation in today’s world. More effective resource management, resulting in increased productivity. If we were to consider three daily test campaigns cycles, software automation testing would start to compensate after twelve days. As previously stated, today’s market contains increasingly complex applications that are constantly improving to offer more features to the end consumer. Between other factors when combined with agile development methodologies it is then possible that these continually mutating products achieve lower time to market business metrics, however, both existing and new features need always to be tested to ensure that they meet the expected product quality standards. Test automation is then a powerful software development ally since it promotes and maintains quality patterns throughout the product´s lifecycle culminating in swifter results in the development cycles without sacrificing the team with quality-related overheads. Eligible product features and candidates for test automation are usually those that were previously developed, those that are considered stable or that have been already manually tested and with known results. On the other hand, unstable, temporary, incomplete features, or those whose automation is so complex, expensive, time-consuming and with high maintenance times are usually left out. This is due to the high initial costs of test automation which are only compensated and supported by successive regression test cycles being a medium for long product life cycles. RequestLibrary – Contains keywords to test Web APIs. Allows you to execute and evaluate HTTP requests, and to analyse messages exchanged with this protocol. Selenium2Library – Interaction and evaluation of elements within an HTML page through interaction with DOM. Used essentially to test Web GUIs. XMLLibrary – Allows for navigation, removal, editing and creation of elements within an XML structure. JSONLibrary – Interaction with a JSON structure. DatabaseLibrary – Interaction with databases. Python, Java and C# - These are more complex programming languages that require more technical knowledge in test automation. They are also more powerful and flexible, allowing greater interaction with the machine, to produce lower level tests. With time to market metrics getting increasingly audacious, one must adopt strategies that allow the development of products without compromising their quality. Continuous Deployment (CD) is a short-cycle software production and deployment strategy that results in a shorter time to market. It is only possible through Continuous Integration (CI), which translates in small, frequent integrations of new code within the existing one. Since CD is as slow as its slowest phase, considering the vast number of code increments in the course of one day, how can we ensure product quality? Continuous Testing (CT) bridges the gap between CD and CI, by executing automated tests as part of a deployment and delivery pipeline. This way, feedback can be swiftly obtained regarding business practices and, consequently the integration and deployment risks of a given code increment. CT principles include maximum possible automation with early, frequent and swift testing. By including CT in the CI mechanism, automated test execution can be triggered through a CI tool whenever new code is added. Manual regression tests can thus be avoided, as they usually presume far superior execution times which can compromise the product’s time to market. There are various CI tools in the market, though Jenkins, Travis, TeamCity and CircleCI are the most commonly used. Generally speaking, these tools support integration with requirement tools and defect management tools such as JIRA, HP Quality Center and TeamForge. Caum, Carl. “Continuous Delivery Vs. Continuous Deployment: What’s the Diff?” Puppet, 30 Aug. 2013, puppet.com/blog/continuous-delivery-vs-continuous-deployment-what-s-diff. Earnshaw, Aliza. “Continuous Integration (CI) Success Depends on Automation.” Puppet, 13 June 2013, puppet.com/blog/continuous-integration-success-depends-on-automation. Kumar, Pavan. “Continuous Testing Opens The Gateway To “Faster Time To Market”.” EuroSTAR Software Testing, 24 July 2017, huddle.eurostarsoftwaretesting.com/continuous-testing-opens-gateway-faster-time-market/. Tricentis. “Continuous Testing vs. Test Automation What QA Needs to Know.” http://www.tricentis.com/wp-content/uploads/2017/03/Continuous_Testing_vs_Test_Automation.pdf. (*) When considering that no human interaction exists during these execution cycles, due to these being normally associated with a CI pipeline already implemented.